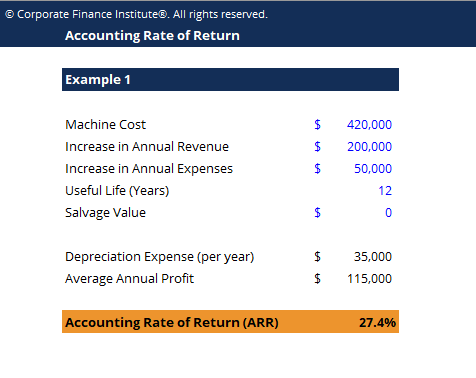 This accounting rate of return template will demonstrate two examples of ARR calculation. Accounting Rate of Return (ARR) is the average net incomeNet IncomeNet Income is a key line item, not only in the income statement, but in all three core financial statements. While it is arrived at through the income statement, the net profit is also used in both the balance sheet and the cash flow statement. an asset is expected to generate divided by its average capital cost, expressed as an annual percentage. The ARR is a formula used to make capital budgeting decisions. These typically include situations where companies are deciding on whether or not to proceed with a specific investment (a project, an acquisition, etc.) based on the future net earnings expected compared to the capital cost. If the ARR is equal to 5%, this means that the project is expected to earn five cents for every dollar invested per year. In terms of decision making, if the ARR is equal to or greater than the required rate of returnHurdle Rate DefinitionA hurdle rate is the rate of return that must be achieved before accepting and funding an investment project. Hurdle rates are used in financial modeling to calculate NPV. If IRR > Hurdle Rate then the investment creates value. The rate is determined by assessing the cost of capital, risks involved, opportunity cost, the project is acceptable because the company will earn at least the required rate of return. If the ARR is less than the required rate of return, the project should be rejected. Therefore, the higher the ARR, the more profitable the investment.